The year was around 200 AD when the outrigger canoe first came to Hawaii. It was then that hundreds of brave souls from Polynesia sailed thousands of miles through the Pacific Ocean in search of land. 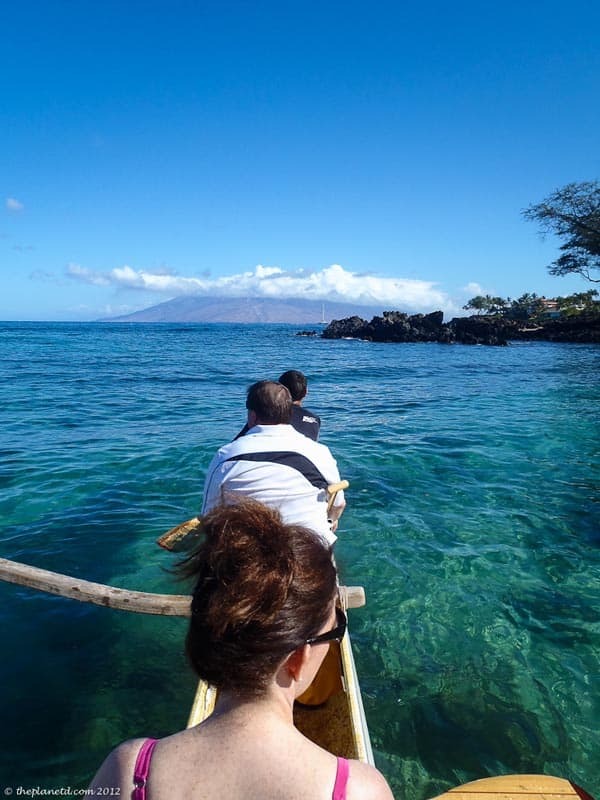 We had our own adventure on an outrigger canoe in Maui. From far away places like the Marquesas and Bora Bora, they watched migrating birds come and go each season and knew that there had to be land somewhere out in the big ocean that surrounded their islands. Over the years they set out in outrigger canoes that were large enough to carry 80 people. They were strapped together and filled with plants, animals and water and each year they managed to sail a little further as they followed the birds towards the Hawaiian Islands. What sets this paddling excursion apart from other boat journeys is the cultural element. We were met by our Hawaiian guides Keoni and Kalani with high energy and smiles. 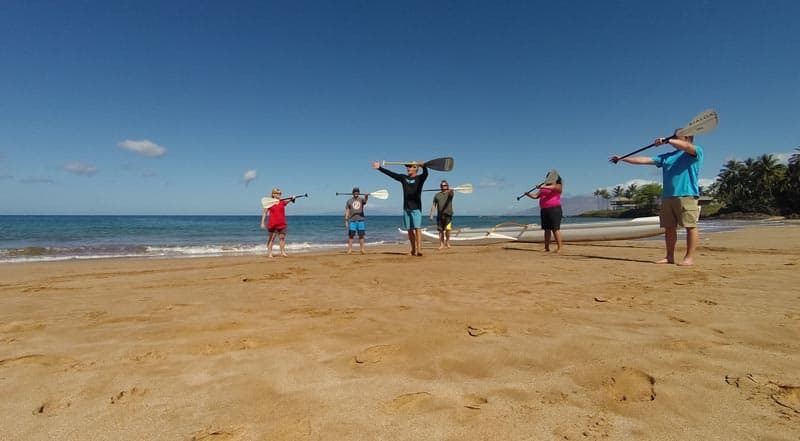 We learned about the Hawaiian language and Polynesian history as we loaded our paddles and gear into the canoe sitting on the beach. They told us about the canoe and how it has been used throughout history. 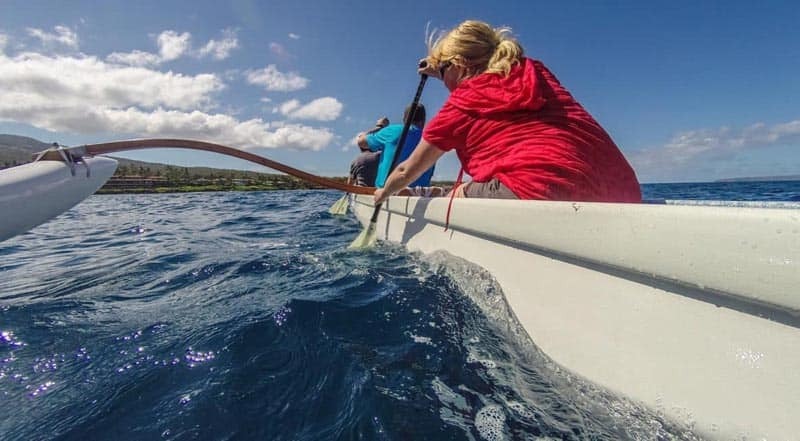 Even today, Hawaiians use the outrigger regularly and there are still people who navigate the world by canoe without the help of maps or GPS. They follow the stars by way of their ancestors. We were told stories of the surrounding islands and how the art of star navigation was nearly lost in the 1980’s. But thanks to a team from the Polynesian Voyaging Society, an elder was found in Tahiti who taught them the ancient tradition before it forever disappeared. Now, there are outrigger canoe clubs throughout Polynesia handing down the traditions and keeping the customs alive. With only four in our party, we had an intimate outrigger canoe experience. We helped push the canoe into the surf and hopped in before the water was too deep. Listening to Keoni's instructions we paddled in unison following Kalani's strokes. Keoni sang traditional Polynesian songs and spoke to us in Hawaiian. We would paddle a few strokes on each side and then listen for his instructions to switch. My favourite instruction came when he said to relax. This was when we learned about the history of the Hawaiian Islands. Keoni had passion in his voice as he spoke about the great chiefs like King Kamehameha who unified the Hawaiian Islands with the aid of the European technology and weapons. We sat in fish pools where we learned that some ranged from 2 acres to 60 acres. These pools were built off the shore to trap fish. It would take thousands of men to transport lava rock from the interior of the island to the sea where they would stack lava rocks upon one another from the sea floor to above the tidal line. It was a land of abundance. 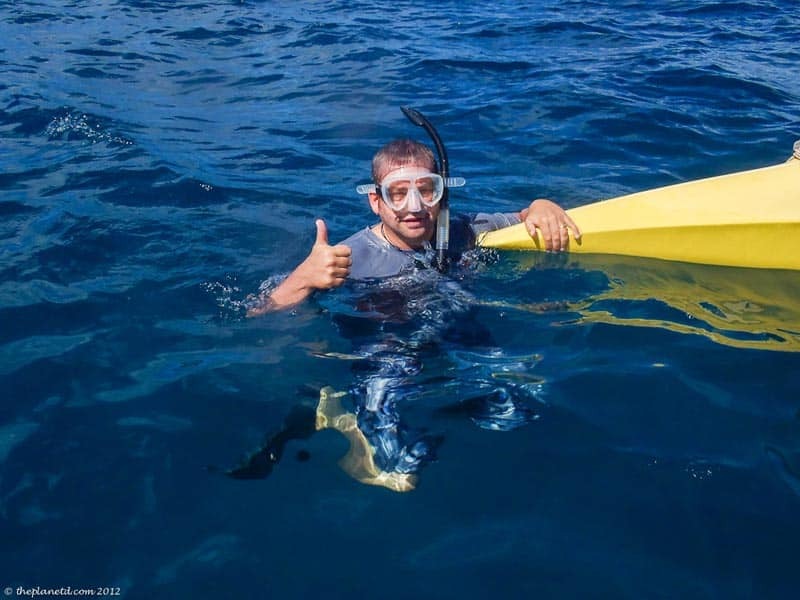 After an hour of paddling and learning about the Hawaiian islands history, it was our time to explore the reef. It wasn't long before we spotted giant sea turtles swimming below. We were very impressed with the strict rules of snorkelling. You are not allowed to go near the turtles and you are definitely not allowed to chase them. We have been to so many places where the rules are too lax and it was refreshing to see a community who is very careful not to disrupt the marine life. 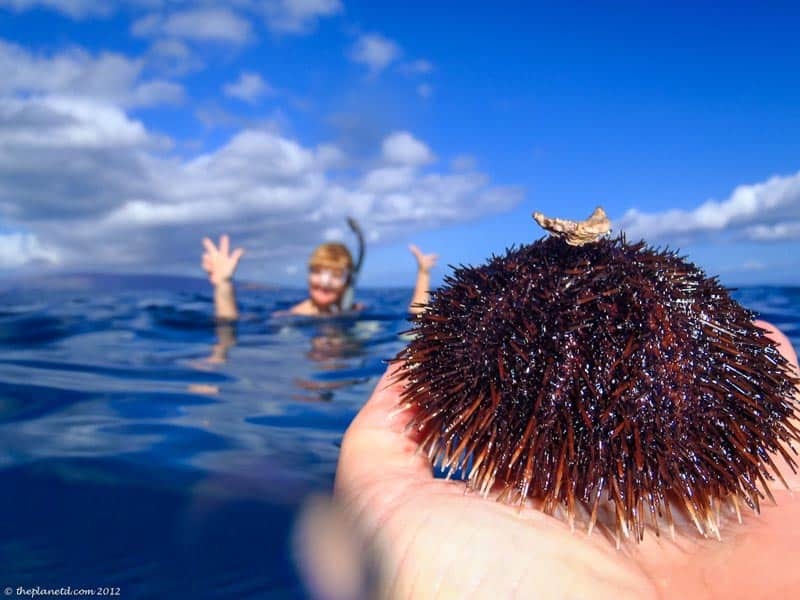 We were allowed to hold a few sea urchins (the non poisonous kind) but only if Keoni or Kalani picked them up for us. They were careful to put every species back to where they belonged and they taught us about which types of marine life were poisonous and non poisonous. It was crazy to see Keoni hold a small shell and tell us that it is one of the most deadly shells in the ocean. If the animal inside decides to shoot out a venom and you happen to be in front of it, it can kill. Needless to say, we kept a fair distance back as Keoni told us all about it. We had plenty of time in the water and shared it only with a few scuba divers below. The snorkelling area wasn't crowded at all and it seemed as if the only way out to the reef was to kayak or canoe. The island of Maui was fully sustainable in the past. At one time, there was a population of over 400,000 people living in a sustainable way on Maui. They lived off the sea and the land, and because they divided their properties in a circular motion around the volcano and highlands, rather than the square grid system adopted today due to western settlement, everyone had plenty of water. 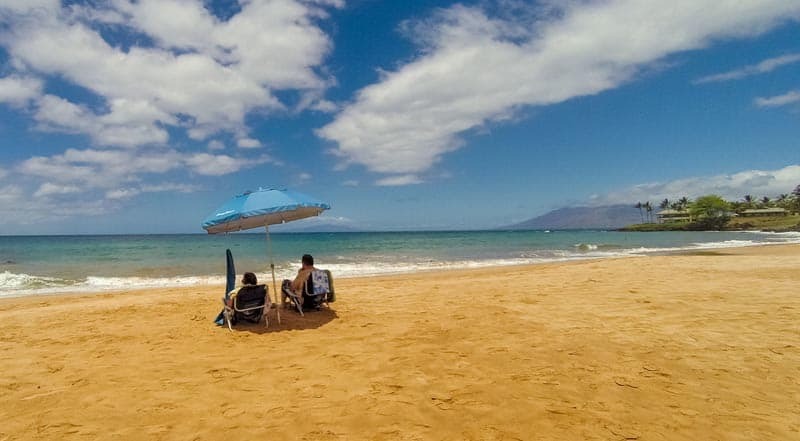 Today, only about 160,000 people live on Maui, but 95% of its resources need to be imported from the mainland. Tim told us that should the tankers not be able to supply Maui, the island would only have 5 days worth of food on the shelves. Perhaps, we could all learn a lesson from the early people of Polynesia and preserve the environment to make our waters flow and land sustainable again. Note: we were very impressed with the chef at our accommodation, the Fairmont Kea Lani – their restaurants support local farmers and as opposed to needing to import 95% of their ingredients like the rest of Maui, they actually only utilize 5% of imported food. 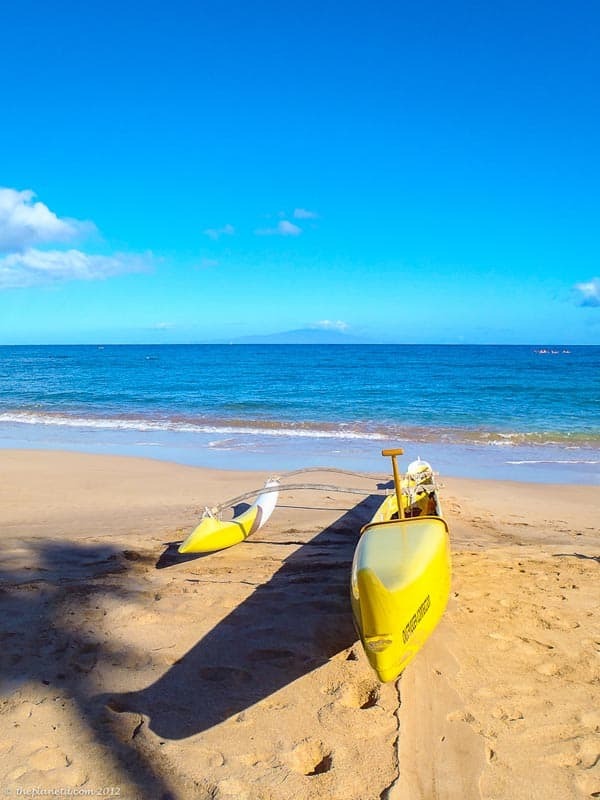 At $75 per person, we found the Outrigger Canoe experience at Makena Beach Resort to best excursion for your buck than any other experience on Maui. 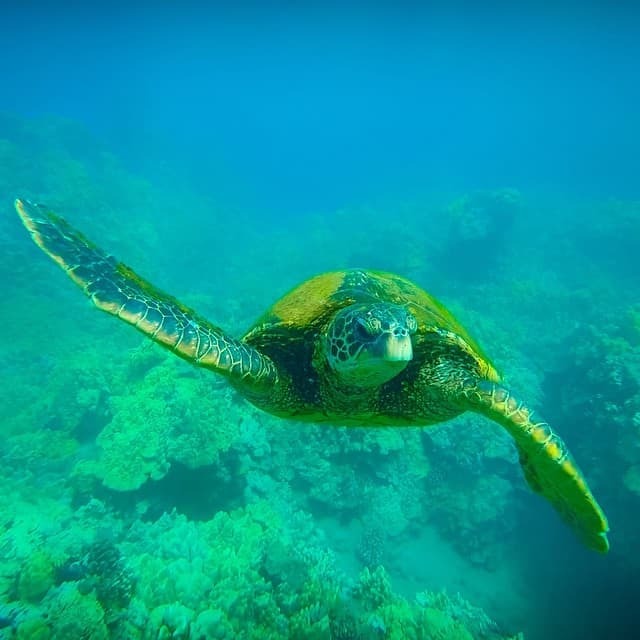 Enjoy more Maui Videos on our YouTube Channel. To find out more about Mekana Beach Resort and the Outrigger canoe experience, visit their website for details. 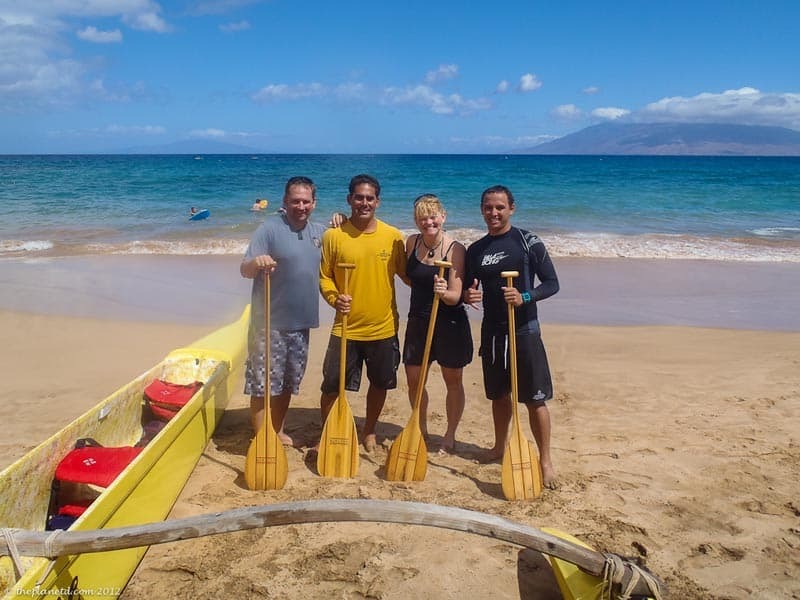 The Outrigger Canoe experience is a trip that everyone should take while visiting Maui. 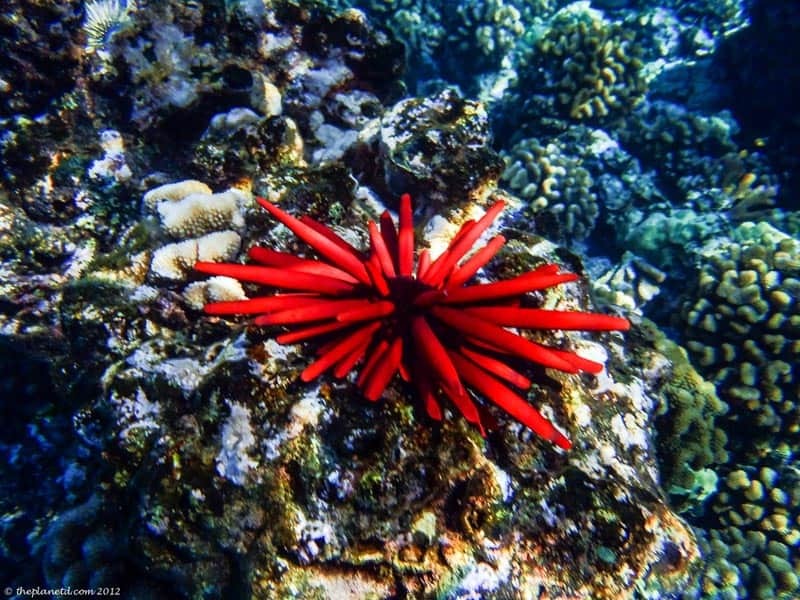 It’s an excellent way to enjoy the water, snorkel in the clear blue seas and to understand the skill and courage of ancient Polynesians who built a culture on these remote islands. 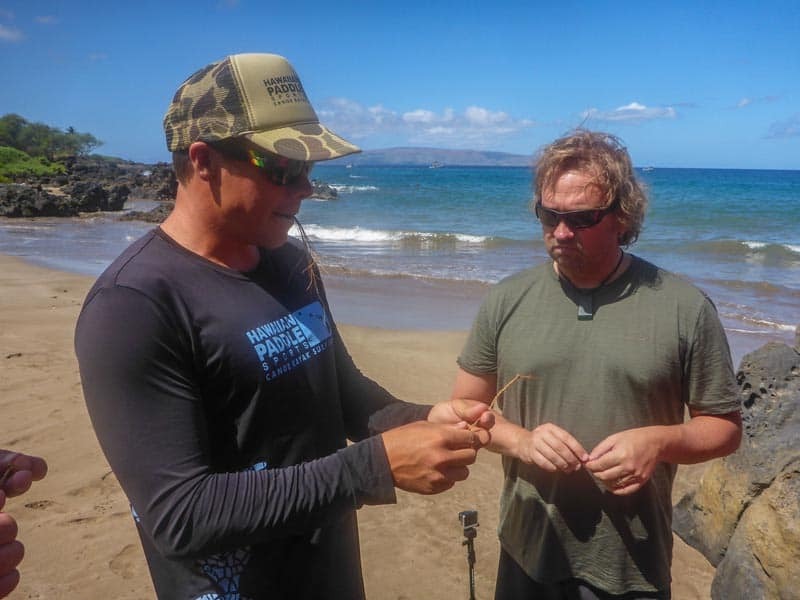 9 Responses to "Outrigger Canoe Maui – A 2000 Year Old Polynesian Tradition"
It was about 3 hours I believe. It was the perfect length of time. We felt that we got enough of a workout, rest, culture and snorkelling time. NOt once were we looking at our watch saying when is it over and not once did we go, oh not that wasnt’ enough time! And yes, we really enjoyed the stories. I found that a lot in Hawaii, it was the history that really made the excursions that much more interesting. Hawaiian culture is rich, beautiful, and still strong! Your post was informative and enlightening. It’s amazing the the ancient navigators found the Hawaiian Islands…truly inspiring. I was part of an outrigger team – just for fun in Vancouver one fall. We used to paddle at night with the city lights all around – a memorable experience. I’d love to try it in Hawaii in some bigger waves. Wow! That sounds like an amazing experience. we were only on a 6 man canoe, but yes, the bigger ones would be an amazing experience. That last photo is awesome! 🙂 This sounds like a fun way to enjoy the water, get some exercise, AND learn about the area and local history — win-win. I love everything that has to do with water and this type of excursion sounds like a dream come true 🙂 and seeing the fantastic sea life, I think the price is not high at all….by the way, what type of camera did you use for the photos? Hi Joseph, we used the Olympus tough waterproof cameras. they take great underwater video as well and they’re compact for snorkelling. You can tie it on to your wrist and capture amazing moments with wildlife.